Also Props to SKD Scans! You guys Rock! Now let´s get to the Chapter! The Chapter starts with Mii, who is barely clinging on her Life. Luckily for her Katya of Corona Borealis has come to help her against that Dryad Emony! Emony Ask her if she has come her ein order to help her “Maid” friend, wich Katya says that no necessarily. Emony Attacks her with her butterflies which Katya freeze. 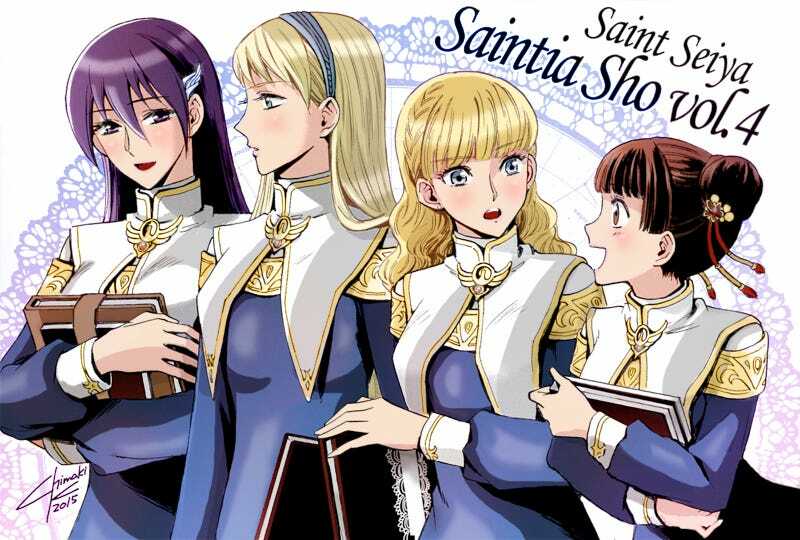 Katya continues saying that she is here in order to fulfill her role as a Saintia, which is secure Athena´s Safety! Emony says that the Saintias only know to say “For Athena´s Sake” and that´s it. That kind of logic won´t get them anywhere! Katya just responds saying that it is weird how Mii fell on such an obvious trap since this is something taht shouldn´t be a problem for a Saintia. Katya rises her Cosmos and with her power she freezes the entire place! Revealing the true form of the Room, which is quite similar to the ones on Athena´s Sanctuary... The Greeck Gods surely like the same theme ,huh? Katya explains how the room worked, which was using the scent of the roses in order to rise illusions to it´s victims. Emony is truly angry at her since she destroyed her favorite garden! Emony is truly mad at her, she shows her Armor and she swears that she will kill both Katya and Mii, and if she does that maybe her Mother will compensate her. Katya was ready to get into a fight until Mii Steps in! She is still damaged and weak, but she says that she will teach that brat some dicipline! she also says to Katya that she must go and keep going forward. Katya accepts and tells Mii taht she must not Die. Mii agrees on that. Emony tries to avoid Katya from leaving but Mii stops her with her technique! Emony is quite angry at Mii and says that Mii only does this because she wants to be praised by Athena! Mii Accepts that maybe inside her hearth she has some of those children wishes... But. Mii starts remembering a Time past, it looks like she got injuried and Saori came to check on her everyday she brings a lot of flowers in order to give her thanks to her. On her way there she rendezvous on Katya who tells her that Athena is not quite comfortable here...That she ahs nightmares every night, that something is treathing against her. Saori is ona Graveyard...All the graves are for Saints that have died in the name of her...Maybe it is the past?, The future?... Her Hearth? The truth is unknown But she was crying. The Vision only stays for a moment and Saori greets her, asking her if she feels better. Mii says that she is fine now thanks to her and ask her if there has been some abnormally on her absence. Saori says that No. And that this is nothing compared to what Mii ahs to endure on her work and her training and gevr her the thanks. Mii gave her the flowers and leaves. She knows that something is wrong. Emony breaks in and laughs at Mii saying that she is truly stupid, and that Athena is useless since she gave to her army only an Armour, not a strong bodyor super powers in order to endure the fights...Athena truly is pathetic. Mii tells her that Emony will never understand what is to fight for somebody else, it doesn´t matter if you get something in exchange...You do it because you care for that person. Emony is truly disgusted with that sort of thinking and explodes on Mii for thinking that way! She says that if she does thingswithout getting anything in exchange, then she is only a Toy to be played with! And that is why Emony will defeat Mii! Says the Dryad. Mii receives it and gets more damaged! Mii says that those selfish feelings might exist inside anybody, but those things are unnecessary for the Saintias! Emony wonders how Mii can endure so much pain how much suffering!? Mii responds that she cane ndure that and much more because Athena is with her. That even if she has a human body, she is giving her all and sacrificing a lot of things in order to bring a world of peace, and that is why Mii wants to stand by her and give her the support she needs and protect her with everything she has! Even if she could never stay on her shoes or understand her suffering...She wants to be on her side in order to give her full support! Mii remembers when both of them were litle and when Saori was crying she left her a flower on her door in order to cheer her up. Mii Attacks and with that attack she defeats Emony! While Emony vanishes in the form of flowers, it looks like she remembers something...Some regrets on her heart...Maybe she was human some time ago. The pictures are blurry but it looks like she was left alone by her fathers. Mii watches the beutiful flower rain of Emony...In those violets there were a white one... After that Mii fells unconscious. Meanwhile Aioria is facing Saga, he doesn´t know what is happening! He demands to know why Saga is here, wasn´t he apologized with Athena and suicided in front of her?! “Saga” Responds saying that he doesn´t know what is he talking about... Taht the only dead man is the one who tried to deny him. That he doesn´t regret any of his actions! and taht is why the Gods gave him a second chance! Aioria starts understanding what is happening now... The split personality of Saga. Could it be that Eris resurected only it´s evil half?! Evil Saga also adds that he is not serving that Goddess either, taht he is in here for his own ambition. He is the stronghest man in the world and because of that he will rule the Earth for himself!, not for any Divinity! Aioria has enough of “Saga” and is decided to destroy him in the name of the victims who died on his plan, and on the name of the true Saga who is no longer with us anymore! A Fight between Gold Saints has begun! The Legendary 1000 Days fight! On the distance... Mu is watching alongside Kiki, his disciple...I tlooks like he knows what is happening with Aioria. Good Chapter! With a lot of development for Mii! The fight was Good also! Also it looks like the Dryads aren´t only some beings made by Eris, but it looks like they were Humans some time ago that have big regrets against the Mankind, or their heart is truly evil, like with Evil Saga. Anyway, my two cents. So see ya next time and happy reading!